Community leaders on a Liverpool estate have been praised by victims' rights campaigner Helen Newlove for standing up to anti-social behaviour. Baroness Newlove, whose husband Garry was kicked to death in Warrington, was visiting the Westminster estate in Kirkdale. Residents have worked with police, the council and housing association to challenge problem families. Ms Newlove said their efforts were delivering "real improvements". The Conservative peer has campaigned on behalf of victims since Mr Newlove, 47, was murdered by a gang of youths outside their home in Warrington in August 2007. After speaking to Kirkdale residents, Ms Newlove called for communities to be given more powers to stand up to the "bullies and troublemakers who blight our neighbourhoods". "If we don't tackle anti-social behaviour around our housing, we will never be able to take back our streets and make our houses feel like homes again," she said. "What we can see in Liverpool is that when we place decision-making powers and resources in the hands of those directly affected, they can deliver real improvements on the ground." Harry Mooney, chair of the Westminster Estate Tenants and Residents' Association, said the estate was once so plagued with "drugs, drink and loud music" that no-one wanted to live there. He and other concerned residents began working with police and housing association Liverpool Mutual Homes (LMH), keeping report books on problem families to challenge their behaviour. "Eventually it worked," said Mr Mooney. "People started saying, 'Hang on - these people aren't going to go away,' and now, either they've gone away or they've changed their attitude. Residents on the Westminster Estate now have to sign up to a local neighbourhood agreement which requires them to take responsibility for the behaviour of their family and visitors and report any incidents. Community leaders then discuss priority issues at monthly meetings with police and council officers and LMH. Steve Coffey, LMH chief executive, said the estate's tenant-led approach made everyone feel they were "in it together". "What you don't want is communities thinking that it's something done to them," he said. Adding: "It's got to be done with the local community and you've got to support the local leaders like Harry." Mr Newlove's murder sparked national outrage and a debate about anti-social behaviour. The father of three had gone outside to confront a gang who were vandalising his car when they set upon him. He suffered massive head injuries and died two days later in hospital. Teenagers Adam Swellings, Stephen Sorton and Jordan Cunliffe, who was 15 when the murder took place, were later jailed for life. 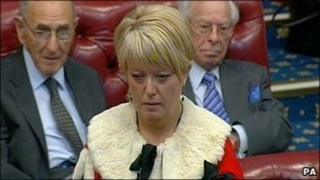 Helen Newlove was made a Conservative peer by David Cameron in July 2010.